Justine, from Spring Valley, Illinois, graduated from the Welding Specialist program at RSI in September 2018. Justine is part of the second graduating class from our new professional welding training program. Thanks for sharing your story, Justine. Was welding a career change? A complete career change. At 19, I started working for a cell phone company, a third party to AT&T. I did that for four years before I became a certified nursing assistant and worked in a nursing home for five years. Then I went to school for criminal justice and did an internship with Cook County PD in Illinois for two years. From there, I went to Wal-Mart distribution before somebody I knew brought me back to AT&T. Within six months, I was in a management position. A year later, I transferred to Arizona. Had you done any welding before coming to school? No, none whatsoever. I was a complete novice. What was your class schedule? There is a morning shift from 7:15 a.m. to 12:45 p.m., but I did the afternoon class from 12:45 p.m. to 5:45 p.m. I’d often go early and stay late. I’m pretty hard-working. I’m the type of person who gives everything 110%, which is the only way to go if you want to be a good welder. Why did you choose RSI for welding school? I’d looked into Tulsa Welding School and I knew they partnered with RSI. 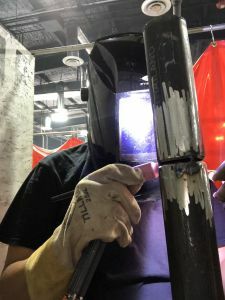 I was leery at first because it was the first year of the welding program at RSI, but when I met the instructor Alex and saw his experience, it seemed like a really great fit. I have to say the program itself. Every day was different. You could always rely on the instructors to help you out and give you the extra time to work at getting better. Overall, it was a really great experience. Let’s talk about being a female in a male-dominated class. How was that? There was one other woman in my class, but being a woman in what you could call “a man’s world” is not a big deal for me. I’m the only girl out of 17 boys in my family, including my brothers and cousins! Growing up around boys toughened me up to handle pretty much anything they could throw at me. Did you need to be tough? What would you say to women considering welding at RSI? All of the guys in my class were really nice and respectful. If I needed help with something, they were always willing. I would say that women should have a thick skin and just joke around with the guys. It will make the transition a lot easier. But don’t be scared to step outside of the box and join the men in this trade. It’s something incredible, and you won’t be able to experience it unless you’re actually here. Women can be better welders than men, but only because we have a lot more patience! You graduated just five weeks ago. Talk to us about getting your first job. I work for Comfort Systems USA. The career services director at RSI, Rick White, sent in my résumé. They called me the next day. Normally, I’m the kind of person who would jump on that, but I let it sit for a couple of days. I had just graduated school, and there were so many different options. A couple of days later, I went in to fill out the application, and they walked me through the shop. The first thing the guy said was, “I would really, really love to have a woman welder in this shop, and actually more women!” His opinion was that women welders work harder and have a lot more patience. It was really nice to hear that. It’s a great company to start out with. I don’t think I could have picked a better place. How was your first welding paycheck? The paychecks are nice, and it is just a start. You have to work your way up from the bottom when you start a new field, and that’s okay. A lot of new graduates want to go straight into very high-paying jobs, but you don’t often get those without experience. When I got this job, I was like, “$16 an hour—that’s not what I want!” but I’m so glad that I took this opportunity. Not only are they teaching me more about welding, they are also teaching me about the fabrication world, which I had never done before. I kind of look at it like they are paying me to continue learning. I’m just doing some light fabrication right now as I’m waiting for my certification to come back, but I will be welding piping for new residential air conditioning units. It’s MIG and flux core welding. The pipe is on a rotator, so as I’m welding, the pipe will be rotating the whole time. It’s challenging. It’s never consistent. It’s always changing. Plus, finishing a project is such a good feeling. I want to get out on the road and travel. My partner wants to attend culinary school, so if I can get out on the road earning good money traveling, then she can quit work and go to school. That’s our main focus. I will be able to get out into the field with this company. It’s basically up to me. The more I certify, the quicker they are going to send me out in the field. I also have the option to transfer to other locations. That is something I’d like to do. I also want to keep building my skills in the trades. I’d like to do HVAC, maybe a little electrical. Ultimately, I want to own my own business. Do you still have connections with classmates at RSI? It’s very important to stay in touch in welding. There are so many opportunities in this field. It’s amazing to have someone reach out to you for a job. It’s wonderful. One classmate is coming for an interview and weld test at Comfort Systems, so I’ve been helping him prepare. The other girl in my class is working in an oil field about six hours from here. They have some positions open, so she contacted me. What advice do you have for new welding students just starting out? Have patience. Be patient with your own progress and the program. When you first start, it’s rough. I had such a hard time when I started because I’d never welded before. Listen to your instructors. There’s nothing wrong with asking for help. Don’t feel embarrassed. If I had listened to Alex more the first couple of weeks, I probably wouldn’t have been so frustrated. Having patience, consistently working hard and not giving up will get you through. It’s easy to quit. I did think, “I don’t know if this is for me. I don’t know if I can do this?” But it’s just having the determination to follow through. Make friends with your peers. You can help them out, and they can help you out. If you get frustrated, take a breath, step back and then just go at it again. Each instructor has their own way of welding. Just take all the information they give you, put it together, and whatever you’re working on will come out amazing!